Progress was the byword of America's Gilded Age, a time of technological innovation, industrial growth, and overseas expansion. It was an era of emancipation for former slaves, settlement houses for immigrants, and colleges for women. Antisaloon leagues called for the prohibition of alcohol while citizens demanded labor regulations and food and drug laws. Confronted by all these forces of change, the Supreme Court appeared the bastion of conservatism in case after case, as they defended the old order. Progressive reformers of the time as well as historians of the twentieth century have depicted the era's nine justices as aging reactionaries or, worse, have accused them of championing a laissez-faire, imperialistic reading of the U.S. Constitution. Now, in Guardians of the Moral Order, Mark Bailey rises to their defense. 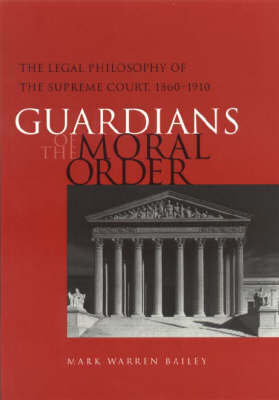 The conservatism of the Supreme Court from 1860 through 1910, he argues, reflected not a conversion to the gospel of wealth but a steadfast belief in the vision of man and society grounded in eighteenth-century Enlightenment ideas and nineteenth-century moral science. Bailey examines the justices' college education and legal training. He then looks at their speeches and writings, both on and off the bench, to discover their views on property, racial equality, and the rights of peoples in America's territories. Faith in a divinely ordained natural order, he concludes, provided the court's model for the social and moral order. The worldview cherished by these men was shared by many Americans educated in antebellum schools, colleges, and law offices. If we are to understand the Gilded Age, as Bailey so convincingly demonstrates, we must acknowledge that ideas matter.